Police have warned firms and the public to take care when opening post after the DVLA in Swansea became the latest organisation to receive a letter bomb. Four workers were taken to hospital after the incident at the Driver and Vehicle Licensing Authority building. Seven devices have been sent in Wales and England in the last three weeks. Police have established a link between one device in Birmingham and two in Oxfordshire. They said no-one had yet admitted sending any of the packages. Over the past four days, letter bombs have been sent to motoring-related companies in London and Wokingham, in Berkshire. A private house in Folkestone in Kent has also been targeted. Police are investigating possible links between those attacks. The investigation into the seven letter bombs is being co-ordinated by Acpo's national co-ordinator for domestic extremism (NCDE), Assistant Chief Constable Anton Setchell. He told a press conference that the letter bombs did not contain "conventional explosives", but were made up of pyrotechnic material designed to shock or cause only minor injury. He added that although animal rights and motorists' groups had been linked to the attacks "we have had no contact from any group or organisation claiming any responsibility or setting out their reason or motivations for the course of action that has been taken". "However, there are clearly some priority lines of investigation." He urged businesses and members of the public to take extra care handling mail and to call the police if they had any suspicions about packages. Four workers were taken to Morriston Hospital following Wednesday morning's incident in Swansea, including a woman who had cuts to her hands and body. The woman, who does not want to be identified, said in a statement: "I was shaken, shocked and frightened. It's hard to describe how I felt. Everybody started running around me and I felt quite calm, but I didn't really know what had happened." One worker who was inside the DVLA when the bomb went off told the BBC that an announcement was made over the tannoy that there had been a "firework-type explosion". "We were not allowed off our floor and word of mouth was spreading a bomb had exploded," he added. On Tuesday a package exploded at the Berkshire offices of Vantis, an accountancy firm linked to Speed Check Services, based in Camberley, Surrey, the provider of digital speed cameras to the police. That followed a letter bomb attack the day before at the central London offices of Capita, which is reponsible for the congestion charging system. Police are also investigating a letter bomb which injured 53-year-old Mike Wingfield at his home in Folkestone, Kent, on Saturday. He said he had "no idea whatsoever" why someone would want to target him for such an attack. In the Oxfordshire and Birmingham cases, the companies received an A5 jiffy bag containing a crude firework-type explosive device. On the back of one of those envelopes, sent to a firm in Abingdon, was the name of Barry Horne, an animal rights extremist who died in 2001 while serving an 18-year jail sentence for a firebombing campaign. 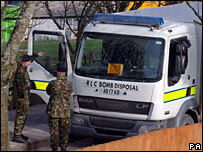 Prime Minister Tony Blair told the Commons that the attacks were being investigated "very closely". He was speaking after Labour's Sian James condemned the attack in her Swansea East constituency. Mr Blair told her: "Can I express my sympathy to all those who have been caught up in those incidents in your constituency and elsewhere and say how sorry we are that they have been put through what is obviously a very traumatic time for them."